Soybean oil, water, sugar, sour pickle relish [cucumbers, vinegar, salt, water, calcium chloride, aluminum sulfate, turmeric (color)], tomato paste, distilled vinegar, contains 2% or less of the following: egg yolk, salt, potassium chloride, spices (mustard flour), propylene glycol alginate, onion powder, xanthan gum, natural flavors, calcium disodium edta (used to protect quality). As part of Unilever, we understand consumers, your guests. We use this knowledge to help chefs and caterers keep up with people’s changing tastes. Hellmann's Classics Thousand Island Salad Dressing offers premium quality with shelf-stable convenience. 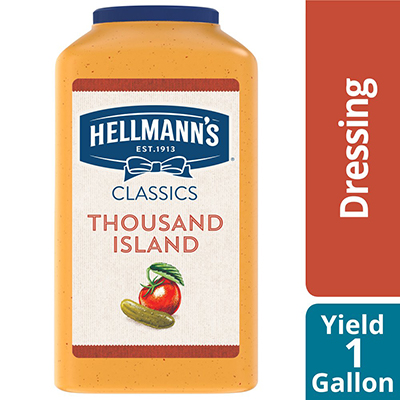 Hellmann's Thousand Island dressing is great for green salads, bound salads, on vegetables, as a dip, sandwich sauce and more.